Introduction: The preterm born infant’s ability to regulate its cerebral blood flow (CBF) is crucial in preventing secondary ischemic and hemorrhagic damage in the developing brain. The relationship between arterial blood pressure (ABP) and CBF estimates, such as regional cerebral oxygenation as measured by near-infrared spectroscopy (NIRS), is an attractive option for continuous non-invasive assessment of cerebrovascular autoregulation. 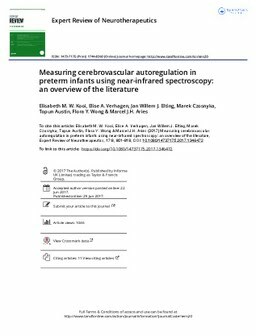 Areas covered: The authors performed a literature search to provide an overview of the current literature on various current clinical practices and methods to measure cerebrovascular autoregulation in the preterm infant by NIRS. The authors focused on various aspects: Characteristics of patient cohorts, surrogate measures for cerebral perfusion pressure, NIRS devices and their accompanying parameters, definitions for impaired cerebrovascular autoregulation, methods of measurements and clinical implications. Expert commentary: Autoregulation research in preterm infants has reported many methods for measuring autoregulation using different mathematical models, signal processing and data requirements. At present, it remains unclear which NIRS signals and algorithms should be used that result in the most accurate and clinically relevant assessment of cerebrovascular autoregulation. Future studies should focus on optimizing strategies for cerebrovascular autoregulation assessment in preterm infants in order to develop autoregulation-based cerebral perfusion treatment strategies.